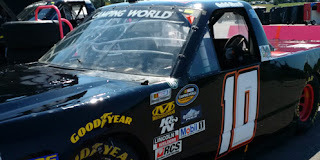 Caleb Roark picked up the 11th last-place finish of his NASCAR Camping World Truck Series career in Friday’s American Ethanol 225 at the Chicagoland Speedway when his #10 Driven2Honor.org Chevrolet fell out with electrical issues after he completed 11 of 151 laps. 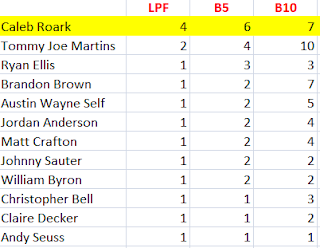 The finish, which came in Roark's 29th series start, was his fourth of the season and second in a row. With seven races to go, Roark now holds a two-finish lead in the 2016 LASTCAR standings, and is three finishes away from tying Johnny Chapman for the most last-place runs in series history. Roark’s was the only of 32 trucks on the entry list to skip the opening practice, then ran 31st in Happy Hour, outpacing Norm Benning by nearly 1.5 seconds. Benning was making his first attempt in his own #6 Chevrolet since Eldora, and was the first appearance by the team on race day since Ryan Ellis’ last-place run at Michigan. Benning improved significantly in qualifying - 152.560mph (35.396sec) to his practice speed of 149.933mph (36.016sec) - but Roark improved as well, edging Benning for 31st with a lap of 156.472mph (34.511sec.). On race night, however, Benning didn’t hold the spot for long. William Byron has had a remarkable rookie season, racking up wins in five wins in 15 races. The only time he’d finished worse than 17th all season was a last-place finish at Atlanta in February, when his Kyle Busch Motorsports-prepared #9 Liberty University Toyota lost an engine on Lap 59. With the points reset for the Chase looming, Byron was a favorite to pad his lead in the reset, securing the 9th spot on the grid. Then, on Lap 4, Byron lost control in Turn 2, slid up the track, and smacked the outside wall. Byron was uninjured, but his truck spent several laps behind the wall, apparently headed for his second career last-place run. On Lap 12, just moments after the restart for Byron’s caution, Roark pulled behind the wall in the #10, followed three circuits later by Benning. Around Lap 47, the KBM crew managed to get Byron back on track, and over the next nine circuits, he passed both Roark and Benning to climb into 30th, securing them the final two spots. Then, on Lap 84, history repeated itself. Byron cut down a right-front tire and pounded the wall in Turn 3, ending his night. Finishing 29th was Jesse Little, making his third start of 2016, his first since Bristol, and first for Mike Mittler, who lost the engine on the #63 Chevrolet after 79 laps. Rounding out the Bottom Five in 28th was Reed Sorenson, who burned the clutch on Premium Motorsports’ #49 Chevrolet. *This marked the first last-place finish for Roark, the #10, and Jennifer Jo Cobb Racing in a Truck Series race at Chicagoland.